Once upon a time, Nicky and Mike over at We Work For Cheese thought of running another month-long writing challenge. As soon as Max completes repairs to the Time Pyramid and hauls it back out of drydock, I’m going to travel back and have a word with them about it. 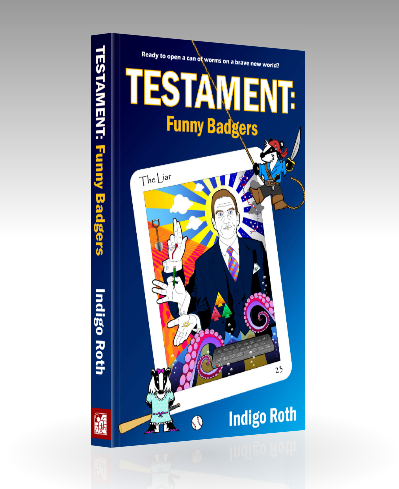 This blog entry has been removed, revised and included in the romping sci-fi epic TESTAMENT: FUNNY BADGERS by Indigo Roth, Red Angel Publishing, 2013. Nice neighbour, Indigo. You're a lucky guy. Very touching; you have a wonderful way with words, sir. You are correct that a haven is not always a place. People can make us feel safe, too. This is a lovely tribute your your special friend. It sounds you are both lucky to have each other in your lives. That is such a lovely image. I'm so glad you have such a special 'haven'. Aw... I can picture you and Abbey now. What a lovely piece. And you are a most-deserving fellow, my friend. I think you made Abbey up. Not that I blame you, of course. It's just that she changes her hair color a lot and I worry about it falling out. Not that she'd be less attractive bald, mind you. Some women, women like Abbey, call pull that look off. "A haven is not a place, necessarily. I am warm, safe and cared for, and everything’s going to be okay. The location isn’t important." That is so true, Indigo! It's easier to believe in an Abby. Have faith bro! Beautiful post, Indigo. Absolutely lovely. Hey Amy! You forgot? Ah, poot! 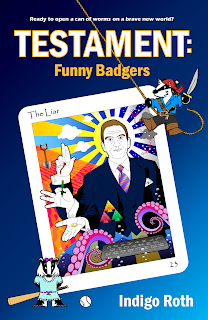 I bet it was a corker, too! I am INTRIGUED!!! Spill it! I am haven-less. Oh woe is me. Sorry - I'm in pity mode. Awww. I want Abbey to hug me too. We could have a group hug. You painted a lovely picture with your words, blue man. Abbey sounds warm, and inviting, and very much alive through your words. I feel the affection and understand the love. Beautiful piece of writing, Indigo. I usually have some goofy retort for you, but this is just lovely! No retort needed. You, my friend, are a haven for many of us here on the internetz. * And Would I Mind Awfully?